On November 13, millions of Americans had high blood pressure for the first time. It wasn’t even Thanksgiving. That day the American College of Cardiology (ACC), working with the American Heart Association (AHA), released new guidelines regarding what constitutes high blood pressure. Since 2003, a reading below 140/90 was considered normal. Now, any blood pressure over 120/90 is considered hypertension. These changes mean nearly half of Americans have high blood pressure, a considerable increase from about 30 percent under the old guidelines. If hypertension rates before these changes were described as an epidemic and a silent killer, the new rates will likely replace the silence with alarm and calls to action. 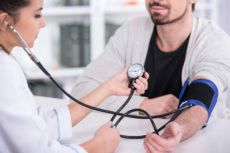 As a first call to action, authors from the AHA and the ACC also provided new recommendations monitor and treat hypertension, which include emphasizing a “team approach,” stress management, self-monitoring equipment, more educational materials, and drastic dietary changes. But how are these changes going to be implemented? Historically, efforts to combat public health problems eschew competition in the market in favor of using the political process. These most recent changes are no exception. Both the ACC and the AHA openly advocate using government to advance their interests. According to the Center for Responsive Politics, in 2016 both organizations spent just under $3 million to lobby the federal government. Whenever government works with special-interest groups to set industry standards it is important to examine the underlying incentives. When government imposes more stringent health standards, more resources are devoted to meet them. This can include more physicians, medical devices, prescriptions, dietary products, and other health-related goods. This is lucrative for many healthcare professionals. Perhaps more importantly, we should ask: How successful has government been in advancing health in the past? Answering this question reveals a repetitive, and concerning, pattern. In 1998, the industry standard for what constituted obesity was also changed per the recommendation of the National Institute for Heart, Lung and Blood Institute. In this case, obesity rates adjusted for older populations, which typically weigh more, were eliminated. The result was a swift rise in obesity rates and the arrival of the obesity epidemic. Government did. The results were widespread, invasive, and costly policies. Among a few of the policies stemming from the obesity epidemic were regulations limiting portion sizes, taxing sugary foods, banning fast-food restaurants in some low-income areas, and mandating required nutrition labels. The government also began funding costly educational programs. In 2014, the Division of Nutrition, Physical Activity, and Obesity, which was started to deter obesity, accounted for nearly $48 million in federal spending alone. For all these efforts, little progress has been made. From 1999 to 2016, total obesity rates increased about 9 percent. Further, evidence indicates obesity policies may work to promote obesity rather than prevent or reduce it. Research finds taxing fast-food restaurants leads to over-consuming fatty foods at home and taxes on sugary foods do not reduce their consumption enough to motivate weight loss. Both may work to worsen dietary choices. Evidence that nutritional labels help consumers make health-conscious choices is mixed at best. Evidence that special-interest groups benefit from these policy changes is, on the other hand, very strong. As of 2009, the medical costs of obesity were estimated at $147 billion. Previously non-existent, obesity medicine has become its own specialty. Medical schools, researchers, and other healthcare professionals receive large federal grants to study the causes and treatment for obesity. With a newfound increase in hypertension rates, history may be poised to repeat itself. The incentive for special interests to use government to advance their goals remains the same. Government’s overreaching involvement in public health remains the same. Only the diagnosis changed. To be fair, hypertension can be a serious if left uncontrolled and can result in a heart attack, stroke, and other life-threatening cardiovascular complications. But hypertension’s seriousness is all the more reason to question the incentives behind its changing standards and the use of government to prevent or treat it. With history in mind, I think it’s fair to take recent call to actions with, ironically, a big grain of salt. Raymond J. March is a Research Fellow at the Independent Institute and Assistant Professor of Agribusiness and Applied Economics at North Dakota State University.